I found out about the newly developing Pearl District, just north of downtown San Antonio, last year. Like many new redevelopments, it combines a mix of businesses and apartments for an urban, downtown feel, though with the convenience of suburban parking. 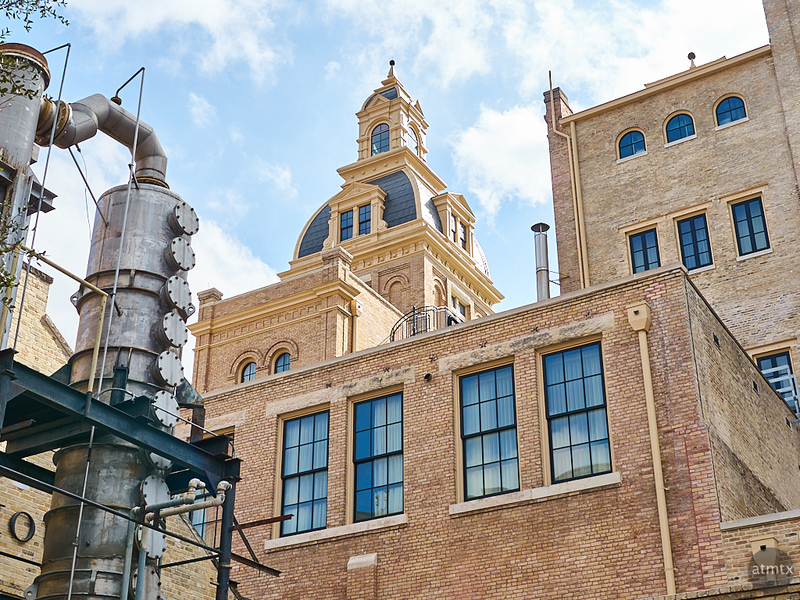 At its centerpiece is the fully renovated Pearl Brewery building. The brewery is long gone, but the structure has been transformed into the delightful and character filled, Hotel Emma. There’s no direct equivalent to the Pearl in Austin, though its kind of like combining the Seaholm Power Plant redevelopment with The Domain shopping center. This San Antonio redevelopment, sized somewhere in between, and with more unique stores and a bias towards food establishments, feels more genuine. It’s hard to emulate authentic 124 year old brick, and the brewery turned hotel stands proud again, since originally being constructed in 1893. Austin is not a very industrial city, which certainly has its advantages, but it lacks these old character filled structures. San Antonio has done an admirable job rejuvenating the past and infusing it with a modern food centered lifestyle. Bravo. I’ll certainly visit the Pearl again for its food and, of course, photography. Yet another interesting place to put on my photography To Do list. I’ve never had Pearl. But given that it’s been owned for a while by Pabst, that might explain it. Looks great! Need to visit asap.